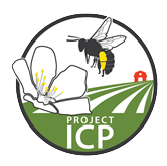 Project ICP receive funding from 2012-2017 from the USDA-NIFA SCRI Program to investigate the performance, economics, and farmer perceptions of different pollination strategies in various fruit and vegetable crops. These include complete reliance on honey bees, farm habitat manipulation to enhance suitability for bees, and use of managed native bees alone or in combination with honey bees. The Project Team had a strong outreach focus, and delivered its findings to specialty crop agriculture through various diverse routes of traditional and new media, including this website. The project funding has ended, but the on-line presence of this project will continue. 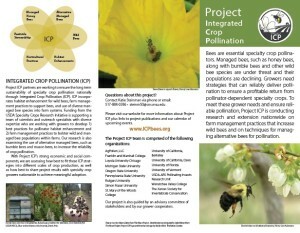 Click Here to read more about Project ICP. This project is supported by USDA-NIFA Specialty Crop Research Initiative Grant (#2012-51181-20105).